The Board of Directors of d'Amico International Shipping S.A. (Borsa Italiana: “DIS”) (hereinafter : “the Company”, “d'Amico International Shipping” or the “Group”), a leading international marine transportation company operating in the product tanker market, today examined and approved the Company’s 2018 Third Interim Management Statements as at September 30th, 2018 (Q3 and 9M 2018 Financial Results). We are amongst the world leading companies in our sector, thanks to our strong commercial relationships with all the main Oil majors and key industry players, to our top-quality standards on-board and on-shore, to our consolidated relationships with banks and financial institutions. Furthermore, we are proud to be part of the d'Amico Società di Navigazione Group, which is financially solid and has been continuously supporting DIS during this adverse market, through share capital increases, additional exercise of its warrants and direct loans. Market conditions across all product tanker sectors have softened further in the first nine months of 2018, largely due to existing oversupply of tonnage coupled with weaker demand trends. Whilst higher bunker prices have capped earnings in 2018, they have also contributed to more limited product arbitrage opportunities, mainly between the Atlantic and Asia, weighing on products trade growth in the year to date. According to Clarksons in 2018, product tanker dwt demand is projected to grow by 2.1%, with the pace of growth slowing compared to recent years, partially due to declining shipments into Southeast Asia and Brazil; this is a sharp decline from their estimate in January 2018 when they forecast product tanker dwt demand growth of 3.8%. The one-year time-charter rate is always the best indicator of spot market expectations. As markets failed to show any signs of improvement in Q3, this rate for conventional (non-eco) MRs has softened to between US$ 12,500 and US$ 12,750 per day. In the first 9 months of 2018, DIS recorded a Net Loss of US$ (41.2) million vs. a Net Loss of US$ (13.6) million posted in the same period of last year. Such variance is mainly due to the weaker product tanker market experienced so far in 2018 and especially in the third quarter of the year (Q3 2018: Net loss of US$ (20.9) million). The first 9 months of 2017 benefitted also from US$ 2.6 million ‘profit on disposal' following the sale of two vessels and from lower ‘Time charter hire costs'. In the first 9 months of 2018, DIS achieved a daily average spot rate of US$ 10,574 compared with US$ 12,290 generated in the same period of 2017. At the same time, 32.5% of DIS' total employment days in the first 9 months of 2018, were covered through ‘time-charter' contracts at an average daily rate of US$ 14,858 (9 months 2017: 33.6% coverage at an average daily rate of US$ 15,573). Such good level of time charter coverage is one of the pillars of DIS' commercial strategy and allows it to mitigate the effects of spot market volatility, securing a certain level of earnings and cash generation even throughout the negative cycles. DIS' total daily average rate (which includes both spot and time-charter contracts) was US$ 11,967 in the first 9 months of 2018 compared with US$ 13,392 achieved in the same period of the previous year. In the first nine months of 2018, DIS ‘gross capital expenditures' amounted to US$ 100.2 million (US$ 56.2 million in Q3 2018), mainly in relation to DIS' newbuilding plan. Since 2012, DIS has ordered a total of 22 ‘Eco design' product tankers1 (10 MR, 6 Handy-size and 6 LR1 vessels), of which 20 vessels have been already delivered as at the end of Q3 2018. This corresponds to an overall investment plan of approximately US$ 755.0 million and is in line with the Group's strategy to modernize its fleet through new-buildings with an eco-design. In addition, DIS has already fixed the majority of its new-building vessels on long-term time-charter contracts with three oil-majors and a leading refining company, all at profitable levels. Time charter equivalent earnings were US$ 55.1 million in Q3 2018 (US$ 65.5 million in Q3 2017) and US$ 180.7 million in the first 9 months of 2018 (US$ 194.2 million in the first 9 months of 2017). Such variance is mainly due to the weaker spot market experienced in the first 9 months of 2018 relative to the same period of last year. On the back of such a depressed market, DIS realized a Daily Average Spot Rate of US$ 8,689 in Q3 2018 (Q3 2017: US$ 11,960) and of US$ 10,574 in the first 9 months 2018 (US$ 12,290 in the first 9 months 2017). Following its strategy, during the first nine months of 2018, DIS maintained a good level of ‘coverage' (fixed contracts), securing an average of 32.5% (9 months 2017: 33.6%) of its available vessel days at a Daily Average Fixed Rate of US$ 14,858 (9 months 2017: US$ 15,573). In addition to securing revenue and supporting the operating cash flow generation, these contracts enabled DIS to strengthen its historical relationships with the main oil majors, which is one the pillars of its commercial strategy. DIS' Total Daily Average TCE (Spot and Time Charter) was US$ 10,680 in Q3 2018 (US$ 12,977 in Q3 2017) and US$ 11,967 in the first 9 months of 2018 (US$ 13,392 in the 9 months 2017). EBITDA was US$ (2.2) million in Q3 2018 and US$ 7.8 million in the first nine months of 2018, compared with US$ 9.0 million in Q3 2017 and US$ 33.7 million in the first nine months of 2017. The reduction relative to last year, is mainly due to lower ‘TCE Earnings' achieved in the period. DIS' EBITDA Margin was (4.1)% in Q3 2018 and 4.3% in the first 9 months of 2018 compared with 13.7% in Q3 2017 and 17.3% in the first 9 months of 2017. Depreciation and Impairment amounted to US$ 10.5 million (US$ 9.2 million in Q3 2017) and to US$ 29.4 million in the first 9 months of 2018 (US$ 27.8 million in the first 9 months of 2017). EBIT was negative for US$ (12.7) million in Q3 2018 (negative for US$ (0.3) million in Q3 2017) and negative for US$ (21.5) million in the first 9 months of 2018 (positive for US$ 5.9 million in the first 9 months of 2018). DIS' Net Result was negative for US$ (21.0) million in Q3 2018 (US$ (7.4) million in Q3 2017) and for US$ (41.2) million in the first nine months of the year (US$ (13.6) million in 9 months 2017). The variance compared to the previous year is mainly due to the much weaker spot market experienced in the first nine months of 2018. DIS' Net Cash Flow for the first 9 months of 2018 amounted to US$ (4.0) million vs. US$ (0.9) million in the first 9 months of 2017. During the first nine months of the year, gross capital expenditures of US$ 100.2 million, were partially compensated by US$ 21.9 million proceeds from disposal and US$ 73.7 million positive financing cash flow. Cash flow from operating activities was negative for US$ (0.5) million in Q3 2018 (negative for US$ (2.4) million in Q3 2017) and positive for US$ 0.4 million in the first 9 months of 2018 (negative for US$ (3.5) million in 9 months 2017). The better result achieved in the first nine months of 2018 was due mainly to a reduction in working capital. DIS' Net debt as at September 30, 2018 amounted to US$ 588.0 million compared to US$ 510.3 million at the end of 2017. The net debt/fleet market value ratio was of 73.7% as at September 30, 2018 vs. 66.6% as at December 31, 2017.  ‘Time Charter-In' Fleet: In January 2018, the contract on M/T Carina, an MR vessel built in 2010 and time-chartered-in by d'Amico Tankers d.a.c. since 2013, was extended for a further 2 year period starting from May 2018, at a reduced rate. In January 2018, the time-charter-in contract on M/T Port Said, an MR vessel built in 2003, with d'Amico Tankers ended and the vessel was redelivered to her Owners. In February 2018, the contract on M/T SW Cap Ferrat I, an MR vessel built in 2002 and timechartered-in by d'Amico Tankers d.a.c. since 2015 and due to expire in December 2018, was extended for a further year, at a reduced rate. In April 2018, the time-charter-in contract on M/T Port Stewart, a Handy vessel built in 2003, with d'Amico Tankers d.a.c. ended and the vessel was redelivered to her Owners. In May 2018, d'Amico Tankers d.a.c. time-chartered-in M/T High Navigator, a newbuilding MR vessel built in Japan Marine United Co. (Japan) for a 8 year period and M/T High Explorer, a newbuilding MR vessel built in Onomichi Dockyard (Japan) for a 8 year period with options to extend the contract. In August 2018, the time-charter-in contract on M/T Silver Express, an MR vessel built in 2009, with d'Amico Tankers d.a.c. ended and the vessel was redelivered to her Owners. In August 2018, the time-charter-in contracts on M/T High Beam, M/T High Current, M/T High Glow, M/T High Enterprise, M/T High Force, all expiring between August 2018 and October 2018, were extended for 1 to 3 more spot voyages. The original fixed hire rate was changed into a ‘floating hire rate' based on the spot market earnings of each of the vessels. Therefore, d'Amico is effectively acting as commercial manager of these vessels, earning a 2% commission on all their gross revenues. As at the end of September, four of these vessels were already included in this new commercial scheme, with the fifth ship joining at the beginning of October.  ‘Time Charter-Out' Fleet: In January 2018, a 3 year time charter contract between d'Amico Tankers d.a.c. and an oil-major expired and the vessel is now employed on the spot market. In February 2018, d'Amico Tankers d.a.c. fixed one of its ‘eco' MR vessels with an oil major for a 1 year time charter contract at a profitable rate. In March 2018, d'Amico Tankers d.a.c. extended a 6 month time charter contract with a leading trading house on one of its LR1 vessels for a 9 months period with a charterer's option for an additional 6 months, at a higher rate. In March 2018, d'Amico Tankers d.a.c. 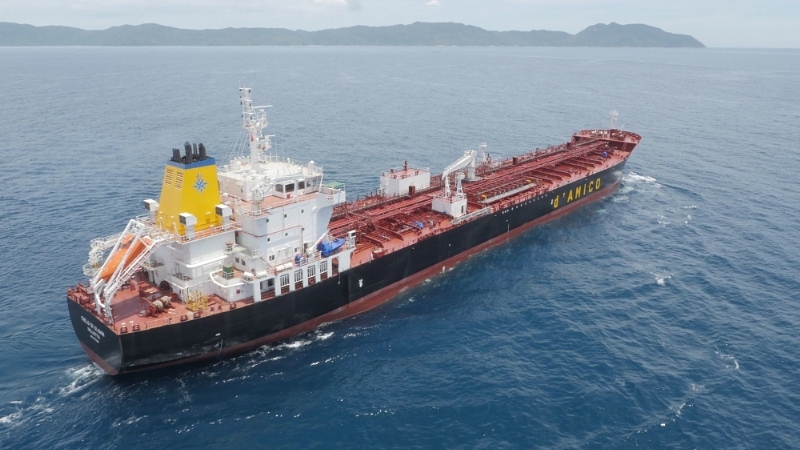 extended its time charter contract with an oil major on three MR vessels. The first of these contracts was extended for 28 months at a profitable rate, with an option for further 8 months; the second contract was extended for 12 months at a profitable rate, with an option for further 12 months; the third contract was extended for 32 months at a profitable rate, with an option for further 6 months. In May 2018, d'Amico Tankers d.a.c. fixed one of its newbuilding ‘eco' LR1 vessels expected to be delivered in Q3 2018, with a leading trading house, for a 9 months charter contract with a charterer's option for an additional 6 months. In August 2018, d'Amico Tankers d.a.c. extended its time charter contract with an oil major on one of its MR vessels for 12 months starting from September 2018. At the same time, d'Amico Tankers d.a.c. fixed two of its MR vessels on a time charter contract with the same oil major for 12 months, with an option for further 12 months.  Newbuilding vessels: In January 2018, M/T Cielo di Rotterdam, an ‘Eco' new-building LR1 product tanker built by Hyundai Mipo Dockyard Co. Ltd. (South Korea) at their Hyundai Vinashin Shipyard Co. Ltd. in Vietnam, was delivered to the Group. In January 2018, d'Amico Tankers d.a.c. agreed with Hyundai Mipo Dockyard Co. Ltd. (South Korea) to take delivery of the remaining LR1s under construction, as per the following approximate schedule: 1 vessel in January 2018, 2 vessels in July 2018 and the last 2 vessels in January 2019.  Vessel Sales: In July 2018, DIS announced that its subsidiary d'Amico Tankers d.a.c. signed a memorandum of agreement for the sale of the M/T Cielo di Milano, a 40,081 dwt handy product tanker vessel, built in 2003 by Shina Shipbuilding, South Korea for a consideration of US$ 8.025 million. This transaction allows d'Amico Tankers d.a.c. to generate around US$ 2.4 million in cash, net of commissions and the reimbursement of the vessel's existing loan. In July 2018, DIS announced that its wholly controlled subsidiary d'Amico Tankers d.a.c. signed a memorandum of agreement and bareboat charter contract for the sale and leaseback of the M/T High Trust, a 49,990 dwt medium-range product tanker vessel, built in 2016 by Hyundai-Mipo, South Korea, for a consideration of US$ 29.5 million. This transaction allows d'Amico Tankers d.a.c. to generate at the vessel's delivery around US$ 11.9 million in cash, net of commissions and the reimbursement of the vessel's existing loan. In addition, through this transaction d'Amico Tankers d.a.c. will maintain full control of the vessel, since a 10-year bareboat charter agreement was also concluded with the buyer, with a purchase obligation at the end of the 10th year of the charter period. Furthermore, d'Amico Tankers d.a.c. has the option to repurchase the vessel, starting from the second anniversary of her sale at a competitive cost of funds. In August 2018, DIS announced that its wholly controlled subsidiary d'Amico Tankers d.a.c. signed a memorandum of agreement and bareboat charter contract for the sale and leaseback of the M/T High Loyalty, a 49,990 dwt medium-range product tanker vessel, built in 2015 by HyundaiMipo, South Korea for a consideration of US$ 28.5 million. This transaction allows d'Amico Tankers d.a.c. to generate at the vessel's delivery around US$ 13.3 million in cash, net of commissions and the reimbursement of the vessel's existing loan. In addition, through this transaction d'Amico Tankers d.a.c. will maintain full control of the vessel, since a 10-year bareboat charter agreement was also concluded with the buyer, with a purchase obligation at the end of the 10th year of the charter period. Furthermore, d'Amico Tankers d.a.c. has the option to repurchase the vessel, starting from the second anniversary of her sale at a competitive cost of funds. Shareholders' Loan: On June 26th, 2018, d'Amico International Shipping S.A. (the “Borrower”) signed a loan agreement with its controlling shareholder, d'Amico International S.A. (the “Lender”). At the request of the Borrower, the Lender has agreed to make available to the Borrower a US$ term revolving facility of up US$ 30,000,000 (the “Facility”). The purpose of the Facility is for the Borrower's long-term corporate purposes and the parties agree that part of the Facility has been granted by the Lender to the Borrower on June 30th 2018 (the “Effective date”) for an amount of US$ 25,000,000. The Facility maturity date will be the day following three (3) years from the Effective Date above (the “Maturity Date”), without prejudice to any earlier Maturity Date coinciding with the end of the Reimbursement Notice Period. Each Advance under the Facility shall carry an interest rate of 3 Months US$ LIBOR plus the applicable margin agreed at 2% p.a. The Borrower has the right to prepay partially or in whole any single advance or the whole outstanding amount at any time. In this case the amount prepaid will be available for future advances. The Lender can demand that part or the total amount outstanding under the Facility be reimbursed by the Borrower at any time with a notice of one year and one day (the “Reimbursement Notice Period”). If at the same time as asking for a reimbursement of the full amount outstanding, the Lender also asks for an early termination of the facility, the Maturity Date of the Facility will be the last day of the reimbursement notice period. Results of d'Amico International Shipping Warrants 2017-2022: on July 2nd 2018 DIS' share capital was increased following the end of the first exercise period of the “d'Amico International Shipping Warrants 2017 – 2022” (ISIN code LU1588548724). During this First Exercise Period n. 518,602 Warrants were exercised at the price of Euro 0.315 per ordinary share, resulting in the subscription of no. 518,602 Warrant Shares – on the basis of a ratio of one (1) Warrant Share, for each one (1) Warrant exercised – admitted to trading on the MTA market of Borsa Italiana SpA, without nominal value and with the same rights (including that to dividends) and features as DIS' ordinary shares outstanding (the “Warrant Shares”). Following such subscription, DIS' share capital amounts to US$ 65,373,392, represented by 653,733,920 ordinary shares without nominal value. Resignation of Marco Fiori, Chief Executive Officer of the Company: on October 23rd 2018, Marco Fiori, Director and CEO of d'Amico International Shipping S.A., announced to the Board of Directors his intentions to resign from the position of Director and CEO of the Company for personal reasons, his resignation to be effective from December 31st 2018. The Board of Directors has accepted his resignation, expressing the most heartfelt thanks to him for the important contribution he has made to the company over the years and wishing him further future professional successes. ‘Time Charter-In' Fleet: In October 2018, the time-charter-in contract on M/T Citrus Express, an MR vessel built in 2006, with d'Amico Tankers d.a.c. ended and the vessel was redelivered to her owners. In the same month, the time-charter-in contract on M/T High Sun, an MR vessel built in 2014, with d'Amico Tankers d.a.c. ended and the vessel was redelivered to her owners (Eco Tankers Limited, in which DIS has a 33% shareholding). ‘Time Charter-Out' Fleet: In October 2018, d'Amico Tankers d.a.c. extended its time charter contract with a leading trading house on one of its LR1 vessels for 9 months starting from October 2018, with an option for further 9 months. The profile of d'Amico International Shipping Group's vessels on the water is summarized as follows. The International Monetary Found (IMF) in their “Global Economic Outlook” stated that global growth for 2018–19 is projected to remain steady at its 2017 level of 3.7%, but that its pace will be less vigorous than projected in April (0.2% lower in each year). The downward revision reflects surprises that suppressed activity in early 2018 in some major advanced economies, the negative effects of the trade measures implemented or approved between April and mid-September, as well as a weaker outlook for some key emerging market and developing economies, arising from country-specific factors, tighter financial conditions, geopolitical tensions, and higher oil import bills. Consequently the International Energy Agency (IEA) lowered their forecast for demand growth in 2018 and 2019 by 110,000 b/d in both years, to 1.3 million b/d and 1.4 million b/d, respectively. This reduction due mainly to the weaker economic outlook, trade concerns and higher oil prices. Also according to the IEA, the Organization for Economic Co-operation and Development (OECD) demand, supported by a strong Q1 18 and robust US growth, will expand by 300,000 b/d in 2018, slowing to 130,000 b/d in 2019. Non-OECD demand will grow by 1 million b/d in 2018, led by China and India, which together account for 60% of the global increase. In the last quarter of 2018, demand for product tankers is projected to grow, driven by an expansion of refining volumes of around 3.1% from a trough of 81.5 million bpd in October 2018 to 84.0 million bpd in December 2018. In the first nine months of 2018, the pace of products trade growth has been limited by declining shipments into some Southeast Asian countries, and higher volumes refined in Brazil, which led to a reduction in imports by that country. However, with the refinery sector in Mexico continuing to struggle, growth in product imports by that country should provide some support, whilst expanding exports from the Middle East and the US should also boost products trade.